When students consider future careers, they often come up short when trying to imagine themselves working in medicine or other health-related fields. “Most kids believe that if they don’t want to be a doctor or a nurse, there’s no place for them in health care,” says Tom Miller, manager of Connected Learning with the Cleveland Clinic in Ohio. Opening middle school students’ eyes to the wide range of opportunities in fields like radiology and physical therapy, among others, is the goal of an award-winning program called Adventures in Health Science and Medicine. 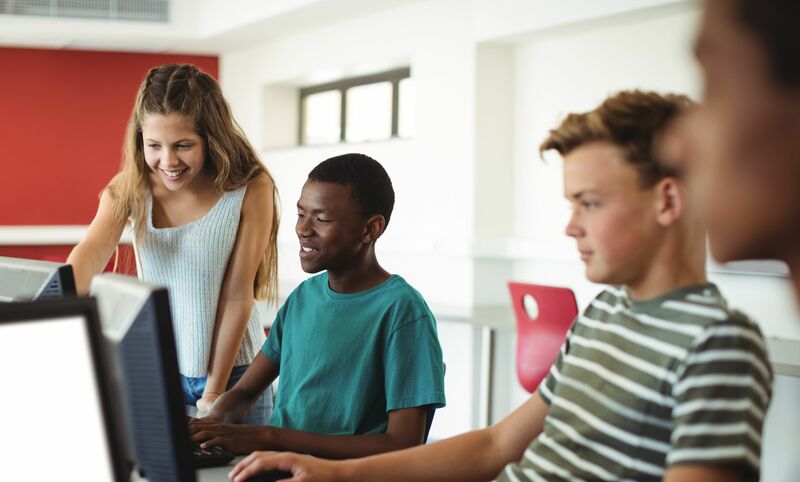 The evolution of AHSM (aka “awesome”) shows how technology is helping to bridge the distance for career education and expanding the pipeline of students heading into health care fields. AHSM began several years ago as a loosely structured guest speaker program of the Cleveland Clinic. The program was popular with schools but faced logistical and scheduling challenges. Bryan Pflaum, director of civic education for the Cleveland Clinic, saw the potential to convert the face-to-face program into connected learning, using technology to bring caregivers into classrooms virtually. Along with the integration of technology, a more cohesive curriculum has evolved over time. AHSM now includes a weekly series of live webinars in which students meet caregivers from different health fields. Students also watch videos that take them inside various health care environments—a program feature first suggested by a high school intern at the Cleveland Clinic. One video, for example, shows all the experts who interact with a patient’s blood sample, from the phlebotomist who draws it to medical lab technicians who conduct tests to physicians who interpret results. “Once the blood sample is drawn, where does it go? Students see the path and all the caregivers who are part of it,” Miller explains. At the culmination of the program, students tackle an innovation challenge to develop a product or solution for a real health issue facing a young patient. In past years, students have shared their ideas via videos, with 3D printed prototypes, and in webinar presentations. Judging happens in real time, with students from other schools choosing winners based on a rubric. Instead of watching canned lectures, students interact with caregivers and learn about the paths they took into their careers. A young man who is now a respiratory therapist, for example, was a high school student in the same school system that participating students attend. That makes him a relatable role model who has a good story to tell. To allow for student interaction during live webinars, participation in AHSM is limited to about 300 middle school students in Northeast Ohio annually. Schools are deliberately diverse, Miller says, including urban, rural, and suburban schools. The Cleveland Clinic has also licensed the model so that other health care systems can offer AHSM in their regions, using their own caregivers as featured health professionals. At Strongsville Middle School in Strongsville, Ohio, Principal Steve Deitrick says the AHSM program “offers schools one more tool in the toolkit” to fire up student interest in science and get them thinking about careers. “If this jump-starts even one student’s path toward health or medicine, then it’s beneficial,” he says. Some students are intrigued to learn about challenging careers that require a two-year degree rather than four years of college. Deitrick has also seen students respond positively to the hands-on activities as well as the project-based learning that happens at the culmination. Solving the case studies requires students to think critically and apply deductive reasoning, skills that the school emphasizes across content areas. AHSM is one of several innovative education programs developed by the Cleveland Clinic to increase student interest in health care careers. An earlier Edutopia post featured the eXpressions program, which integrates the arts with health sciences. Another distance learning program, called Worldwide Classroom, features webinars on hot topics in health care and medicine for high school and middle school student.